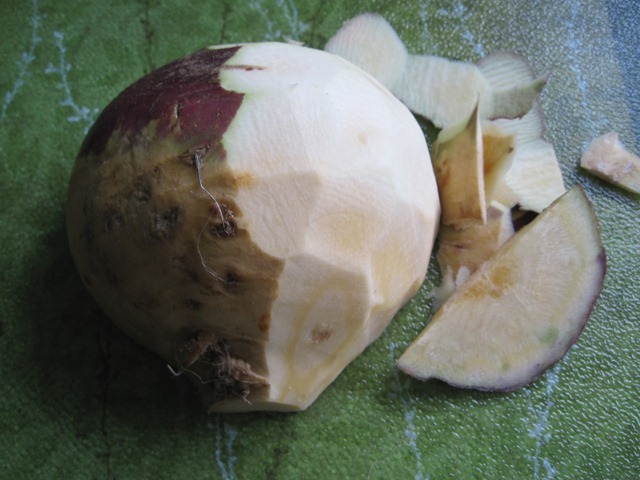 Don’t turnip your nose at Rutabagas! 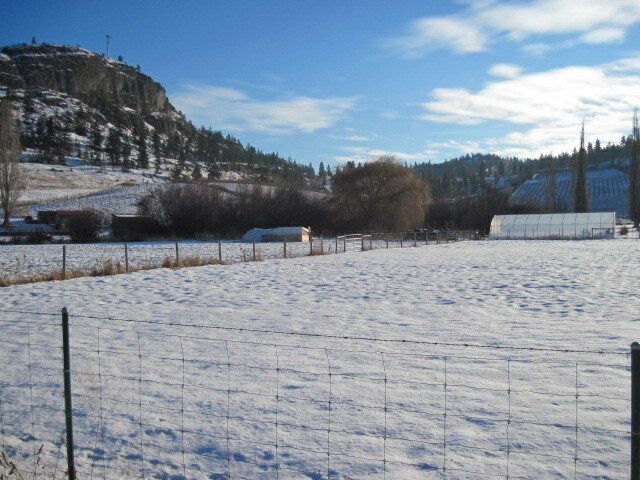 Part two of Consider the Lowly Rutabaga posted January 24, 2011. The past week at the farm has found me knee deep in rutabagas and research. I was very interested to read that the ARSI (Advanced Rutabaga Studies Institute) has declared 2011 International Year of the Rutabaga. I couldn’t be more pleased. As a student of the rutabaga, it is high time that the profile of this under appreciated root vegetable is raised. There is definitely an anti-rutabaga bias out there. I have combed through many cookbooks looking for rutabaga recipes but, sadly, there is a dearth of recipes using rutabaga as an ingredient. Apart from the ARSI, the Scots have been torch bearers for the rutabaga by immortalizing it in one of the most celebrated events in the Scottish cultural calendar. I am, of course, referring to the Burns Supper held every January 25th in honour of the great Scottish poet, Robbie Burns. The Haggis may be the great chieftain o’ the puddin-race but “bashit neeps” are also an integral part of the Burns Supper. “Neeps” are, quite simply, mashed rutabagas and no traditional Burns Supper is complete without Haggis wi bashit neeps an’ champit tatties. To demonstrate my commitment to the rutabaga, I am submitting herewith a photo of Lily, our farm Rutabaga Manure Specialist (not to be confused with Lily, our granddaughter, and a specialist in her own right). I am also submitting a photo of our rutabaga patch in the dead of winter (close your eyes and use your imagination would you). 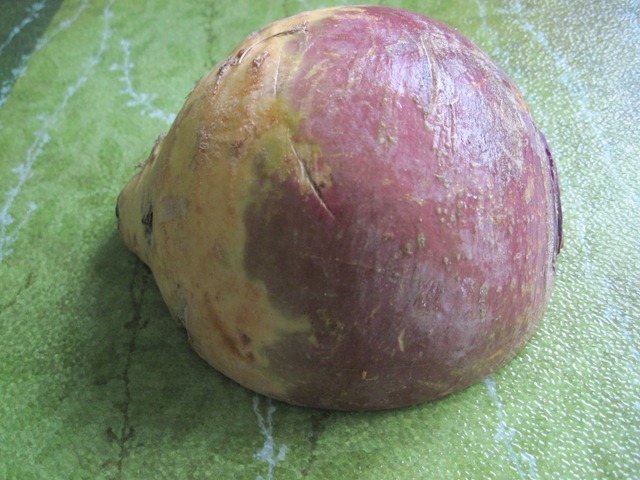 The following recipe for Rutabaga Timbales makes a lovely first course or side dish. Timbales are round molds of a baked creamy puree. They look sophisticated but, on the other hand, they are deceptively easy to make. For presentation they can be served surrounded by a sauce or a few snips of chives or parsley. 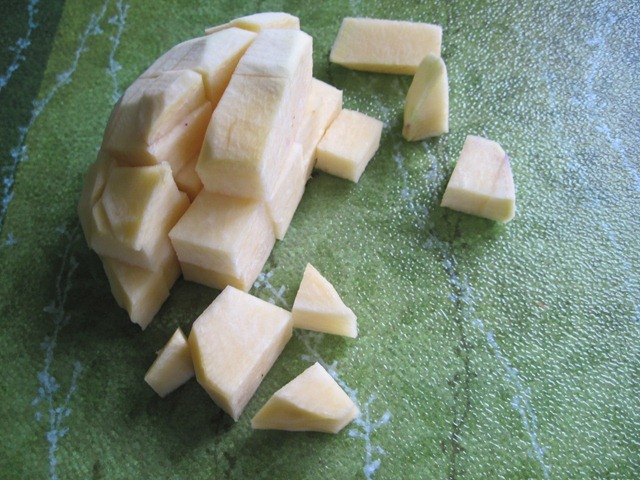 Serve rutabaga timbales with main dishes that rutabagas might usually be paired with: beef, lamb, pork, poultry or Haggis. Or for a vegetarian option, serve the timbales as a main course. 1. Preheat oven to 375F. Generously butter 4 x 5 ounce ramekins or 5 x 4 ounce ramekins. 3. Puree until smooth. Measure two cups puree, more or less, into saucepan. 4. Stir cream into puree, raise heat and bring to a boil. Reduce heat to medium and cook, stirring often, until cream is absorbed. 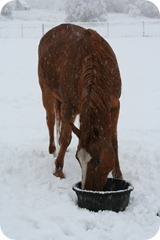 Remove from heat and cool for 10 minutes. Season to taste with salt, pepper and nutmeg or mace. Season well so that timbales will not be bland. 5. Whisk eggs in a medium sized bowl until blended. 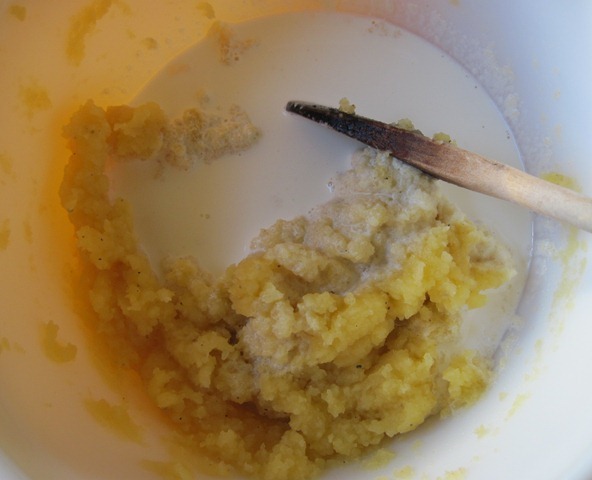 Gradually whisk in rutabaga puree. 6. Divide rutabaga mixture between the ramekins. 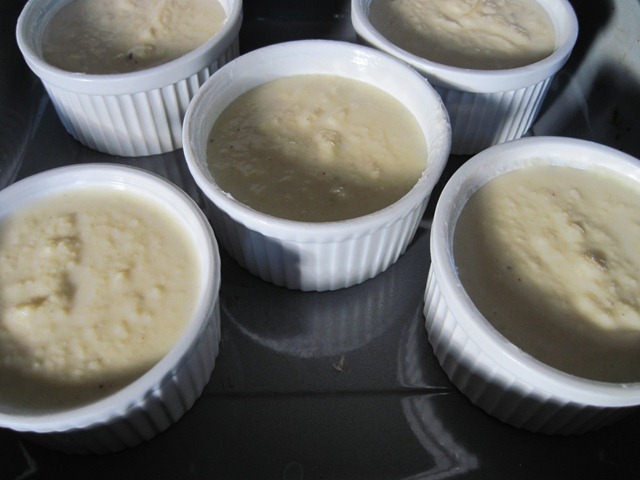 Set ramekins in a roasting pan and transfer to preheated oven. Add enough boiling water to roasting pan to come halfway up sides of ramekins. Set a sheet of buttered foil on top of ramekins. 7. Bake for 45 minutes or until firm to tough. 8. Remove ramekins from water bath and cool on rack for 5 minutes. Run a thin bladed knife around the edge of each ramekin. Set a small plate on top of the ramekin and invert. Gently lift off ramekin. Repeat. 9. Drizzle with reduced white balsamic vinegar. So, there you are fellow rutabagans. Please join me and millions of other covert rutabaga lovers in celebrating the year of the rutabaga in recipes, in song and in praise! THANKS for the follow!